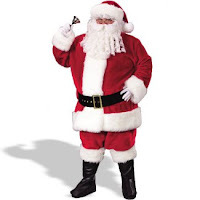 How do the various ideologies and faith traditions view the man in the big red suit? Here is how I imagine some might comment on Santa. this is awesome... I especially love the materialist view on Santa! Awesome and very funny! One minor clarification, though. You seem to be confusing Jehovah’s Witnesses with Mormons. The Mormons believe that Jesus came to the Americas, not the JWs.